This week, we talk about four fairly disparate titles from Vertical, Inc, Viz Media, and Yen Press. MICHELLE: Well, even though it feels like Tuesday, the calendar informs me that it’s Wednesday. Which can mean only one thing! MELINDA: Dawn’s in trouble? No, wait… I have that wrong. MICHELLE: Haha! You have beaten me to the Buffy reference! What is the world coming to? MELINDA: No good, no good at all! What’s on your plate this time? So, yes, books! Well, after last week’s focus on manga for kids, I guess I must have felt the need to remember my age (or at least feel it). It’s been all dark, broody shonen and dark, thinky josei for me this week. 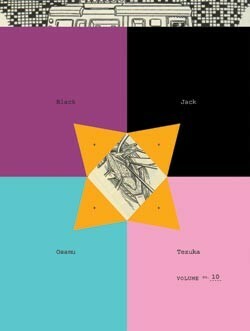 I’ll start with the one I feel guiltiest about, volume ten of Black Jack. I’ve had this volume for several months (with two more in the stack still waiting–hence the guilt), but despite the fact that everybody told me it would be no big deal to just jump in anywhere, “it’s totally episodic, blah blah blah,” I was determined to work my way up from the beginning (thank you, local library system), and honestly I’m glad I did. While I can see that it would not be at all difficult to catch on to the premise from any given point, there’s really so much nuance to this series, and much of that I would have missed. Even some fairly major bits of characterization go all the way back to the first volume, like the origins of Pinoko (Black Jack’s childlike companion) for one. Something like that, though it’s not essential to the plot of this volume, is still a pretty significant factor when it comes to understanding Black Jack and his general worldview. MELINDA: Perhaps even more importantly, going back to volume one gave me the opportunity to really enjoy falling in love with this series like everyone else already has. I’ve been hearing for a long time, of course, how great the series is, but the premise as I understood it wasn’t particularly compelling for me. I’m generally uninterested in doctors as a subject for drama or entertainment, and I’m not a huge fan of episodic storytelling either. What finally reeled me in was my deep enjoyment of Ode to Kirihito. I figured that if Tezuka could get me interested in a story about a disease that turns people into dogs, he could get me into anything. I wasn’t wrong. Though Ode to Kirihito provides the kind of overarching narrative I generally prefer, the sheer length of Black Jack allows for a more intense study of a single character than you’re likely to find almost anywhere. Black Jack is absolutely, gorgeously ambiguous in just about every way. He’s the kind of character who, had he been a superhero, might have gotten me interested in superheroes. He’s got the dark origin story and superhuman abilities, and though he’s often quite compassionate, he’s also capable of the emotional detachment of a dedicated mercenary. He’s not really above anything, including lying, cheating, and outright revenge. One of the most riveting stories in this volume, for instance, is one in which he’s approached by his estranged father who begs him to perform a vital facial reconstruction on his current wife (the woman he left Black Jack’s mother for). Black Jack agrees to do the surgery, but he wreaks his vengeance in a truly coldblooded fashion. Actually, that’s probably a poor description. His revenge is far from cold. In fact, there’s so much white-hot anger and genuine pain in it, it’s surprising that he can remain calm enough to complete the task. In moments like these, Black Jack is a truly dark and fearsome character. Yet this chapter sits alongside stories so poignant they actually made me cry, like the later installment “Strangers at Sea,” in which Black Jack treats a wounded dolphin that ultimately sacrifices itself to save the lives of the very same humans who injured it in the first place. Though the two stories I just mentioned are quite different on the surface, they both reflect the overall tone of the series, which seems dedicated to revealing the deep injustice at the core of our world. That sounds incredibly depressing, and maybe it is, but where there’s a sense of helplessness in a world like that, there is also the sense that, without the cozy security provided by some Cosmic Force of Justice, people are the only ones responsible for their actions and decisions, which is a view I can very much appreciate. MICHELLE: I love ambiguous characters, and both of the stories you single out for mention sound extraordinarily awesome in their own way. I, too, have a lot of guilt associated with Black Jack, for though I own all the volumes currently available (including the limited edition hardcover editions of the first three) I haven’t read any. I hope the details of his revenge aren’t too icky. MELINDA: No, not icky at all, actually, and… well, pretty freakin’ satisfying. It’s kinda hard not to get into the revenge. It’s that good. And speaking of good, wow, I have to laugh at the fact that there was once a time when I was afraid I wouldn’t be able to get into Tezuka’s “dated” artwork. Black Jack is visually striking, page-to-page, and I’m not just wallowing in aesthetics. Tezuka’s visual storytelling is crisp and uncommonly vivid in both expression and narrative. I’ll be saving my pennies to pick up this series for my own collection. You know, despite my complaints about episodic stories, it’s probably one of the aspects of this series that makes it especially re-readable, and I expect to reread it often. MICHELLE: Yeah, it’s amazing how little time it takes one’s initial reaction to Tezuka’s style to completely wear off due to the power of his storytelling. As for me, I haven’t been reading anything near as noteworthy as Black Jack, I’m afraid. MELINDA: So, now that I’ve taken up half the column with just one book, maybe I should let you get a word in edgewise, eh? What have you been reading this week? 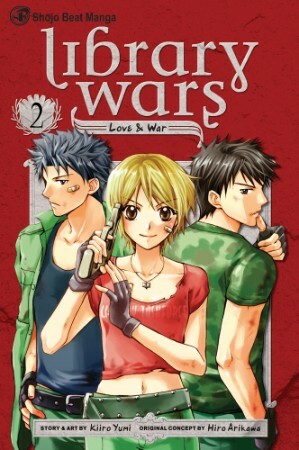 MICHELLE: The first thing on my agenda is the second volume of Library Wars: Love & War, a relatively new series in VIZ’s Shojo Beat imprint. I didn’t like volume one as much as I had hoped—I found the concept ill-defined (The censorious federal government wants to destroy offensive books so local governments have formed their own forces to protect libraries. Or something.) and the heroine, Iku, annoying—and I liked the second volume even less. What bugs me the most is that Iku has been picked to be a member of some elite force but spends most of her time being fairly inept. She can’t shoot worth a damn (It’s a noteworthy occasion when she manages to hit the paper, much less the target. ), nearly mis-shelves books, and demonstrates a profound lack of ignorance about a significant event in library history. She spends a lot of time thinking about her commanding officer (who says things like “Women shouldn’t get all scratched up like you do”), unable to decide whether she likes him or hates him, as well as pondering why her antagonistic fellow enlistee has asked her out. About the only time Iku shows competence is during a sudden raid on a library, when she instinctively does the right thing in the heat of the moment and is pretty much single-handedly responsible for saving some books. I actually found Iku’s roommate, Asako, a lot more interesting. Not only does she put some clues together regarding missing books, she discovers that the library’s temporary director is in league with the federal government. Plus, she finds all of Iku’s romantic silliness “very entertaining,” which puts me in mind of Tomoyo from Cardcaptor Sakura, the elegant best friend who enjoys observing the spazzy heroine. Asako really should get her own series and leave Iku behind. MELINDA: What is it with clumsy, clueless heroines? Ugh. I’m completely with you here. I’d much rather read a story about a smart, capable girl than one who just stumbles into doing something smart almost by accident. Also, I’m especially irritated to see this kind of heroine at the center of a story about libraries. When I think of the real women who are protecting books in our society, I think (of course) of librarians, and there could not be a smarter, more capable group of women on earth. I realize this story is not technically about librarians, but really. And now I’m getting all ranty about a series I haven’t even read. Um. You rant more. MICHELLE: Well, this isn’t just about libraries, but about a military body. And what kind of military body has a commading officer who chastises one of his charges for getting scratches? Or is peopled almost entirely by bishounen, with the exception of the Major, whom they trot out on occasion to be leaderly. I think what irks me the most is that this really could have been good, but it’s just sloppy and generic. MELINDA: Do you think it’s doomed to stay that way? Is there any kind of bright spot? Aside from Asako, I mean. MELINDA: Well, that’s just sad. MICHELLE: Yup. So, why don’t you cheer me up with some of that promised josei goodness! MELINDA: As you wish! 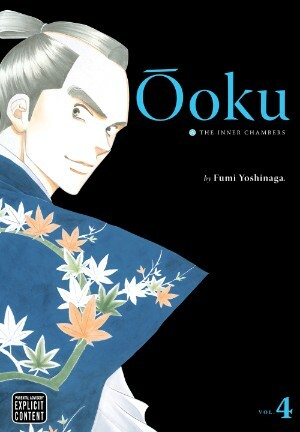 My second selection this week is volume four of Ôoku: The Inner Chambers, Fumi Yoshinaga’s exploration of an alternate version of Edo-era Japan. I’ve already raved about the series’ first three volumes, but the fourth is probably my favorite so far. For those not in the know, the series’ premise rests on a fictional disease which wipes out the majority of Japan’s male population, leaving women to take on traditional male roles in the society, up to and including that of shogun. Though a lesser storyteller might try to portray this as a simple role reversal, Yoshinaga recognizes the impossibility of that, especially within the time period. Despite the fact that women vastly outnumber men in this alternate history, the society’s patriarchal roots remain firmly in place. Even the country’s first female shogun sees herself as little more than a placeholder for the family’s rightful heir. This volume is especially weighted in the reality of this, which is part of what makes it so powerful. Though women are, by necessity, forced into male roles, the reverse does not occur. “…women took on all the labor in the land, from childcare and housework to the trades and farm work.” Boys are coddled like priceless treasures, and though they are expected to sire children, they are certainly not tasked with raising them. What’s most striking about Yoshinaga’s alternate world, however, is that she does not attempt to use it to create some kind of matriarchal utopia. There is nothing “soft” or just about this world. Its privileged leaders are as myopic and morally stunted as any of their kind, and the lives of everyone below them are just as brutal as they would be under the previous shogunate. This is part of the series’ brilliance, because what it really reveals is the brutality of the time–its basic injustices and unavoidable realities. There’s a scene in this volume where we’re shown that elderly men represent such a burden to their families that it is commonplace for them to be abandoned in the hills to starve to death. This is the world the women inherit, and there isn’t much movement to change it. The only revolutionary action in this entire volume is initiated by a group of men with no purpose but to restore male rule. It’s not pretty, by any stretch of the imagination (unless you’re talking about Yoshinaga’s drool-worthy artwork), but it’s a fascinating study of the time period, facilitated by the AU. MICHELLE: I am woefully behind on Ooku. I really have no good excuse, especially when I know how brilliant Fumi Yoshinaga is. I think I’ve been slightly frightened off by a warning I received regarding a “cat incident” in volume two. MELINDA: I remember that cat incident. You’re right to be frightened. It’s… a very bad cat incident. But it’s still worth it, I promise. I should mention that though this volume doesn’t provide as much to like in its characters (the newest female shogun is a horrid person, perhaps only eclipsed by a manipulative male character she eventually appoints to the office of Senior Chamberlain), it offers much satisfaction in terms of complexity and plot. MICHELLE: That is a good distinction to make. Sometimes I’m in the mood for complexity and sometimes I just want to like people. We certainly have been tough on our protagonists today! MELINDA: That’s true! Could it be… us? Um. So. What else have you got? 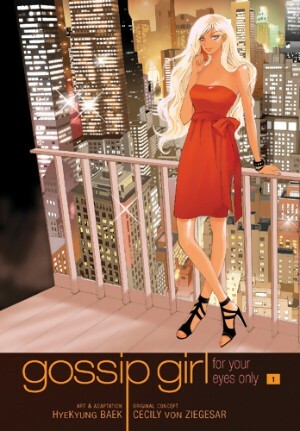 MICHELLE: More of the same, alas, for I have ventured to read the first volume of Yen Press’s latest YA adaptation, Gossip Girl: For Your Eyes Only. I’ve never read the original books or seen the TV show, but I was intrigued that the story would be drawn and adapted by manhwa artist HyeKyung Baek, about whose series Bring It On! I have heard good things. Unfortunately, I despised most of the characters so vehemently I failed to pay much attention to the art. This is the story of a rich girl named Blair whose boyfriend Nate slept with her friend Serena at some point before the story started. Rather than be angry at Nate, Blair resolves to get even with Serena by stealing Serena’s new love, a rather dull guy named Dan whom she (Blair) uses mercilessly. The only problem is, every time Blair launches a scheme to make Serena’s life miserable, the latter’s amazing luck ends up handing her something awesome on a silver platter. At various points, the narrator makes comments like “Poor S” or “Poor B,” but I am amazed we are actually supposed to feel bad for these entitled brats! It really was a struggle to get through this volume. The only character I liked even a little was Vanessa, whose tomboyish manner and appearance makes her the cast member who most resembles a manhwa lead. I also liked how her ambiguous sexuality was handled, but she’s such minor character I doubt it’s going to go anywhere interesting. MELINDA: Is this a new trend in YA fiction? For all the girls to be genuinely hateful? I haven’t read this, but I remember we both had a similar reaction to The Clique. Is it us? Are we old fogies who don’t understand the values of today’s youth? MICHELLE: I actually liked The Clique more than this; at least there was evidence the rich girl at the center of that one had a heart. Here they’re all just obsessed with revenge and/or throwing their money around in as lavish a way as possible. MELINDA: What do you suppose is the appeal? I know the books are incredibly popular. MICHELLE: Music, fashion, gossip, and all-night parties? I really couldn’t tell you, other than some find it fun to watch rich people behaving badly. I can only assume there is more nuance in the books and/or TV show. MELINDA: Ooooooh ho ho, you’re clever, invoking the dreaded NANA copy! Dear girls: Read NANA instead! MICHELLE: Seriously. It has rich hotties, too! So, thanks to my early verbosity, we’ll wrap it up at four tonight. Join us again next week for an all new Off the Shelf! Although I love Ooku and enjoyed the fourth volume, it felt like the weakest volume in the series since it jumped around so much and it read like Yoshinaga was getting through the “boring” stuff to get to what she really wants to write about and I think the lack of a singular focus hurt the volume a little bit. When she does get to Tsunayoshi, the volume did pick up again though. Personally, I was never a big fan of the jump back in time since I liked Yoshimune and while I did enjoy the parts with Arikoto and Iemitsu, I had kind of hoped the series would jump back to Yoshimune after the Arikoto/Iemitsu stuff. Everything in between Iemitsu’s death and Yoshimune did seem kind of pointless to me and all of the interesting things seemed like set up for the next volume which made this one, as good as it was in places, feel like filler to me. Speaking of all girls being genuinely hateful, doesn’t that bring to mind Hot Gimmick and Gakuen Prince (also Imadoki)? Hot Gimmick had a lot of hateful characters, but probably the ugliest were the heroine’s schoolmates. I mean, while she’s getting manipulated by her boyfriends, her girlfriends should be there to support her, but instead she is snubbed, smeared, and left alone. An accurate, and digestible depiction would be the Mean Girls film. The hateful females in Gakuen Prince are (surprisingly) easier to digest than Hot Gimmick, but still. Where is the love, girls? PS. How rampant art the “thee”s and “thou”s in Ooku? Are they fewer? Annoying at all? Yeah, I noticed it less and less in volume 1, too. I’m surprised you answered that over my comment about hateful females; was it sexist? Ohmigosh. Dare I ask what the ‘cat incident’ was about? I know the character in Otoyomegatari (by Emma creator Kaoru Mori, to be pub’d by Yen later) shoots a hare, but is it worse than that? I don’t want to go into detail here (and my memory of specifics is a bit fuzzy anyway), but I will say it’s an especially heartbreaking cat incident. *Though* for what it’s worth, it didn’t make me break down so much I had to (temporarily) stop reading the volume like the dog incident at the beginning of Pluto 4 did. I get the gist, but it still wouldn’t take away much from the series if I were to come across that scene. At least I know there are animal lovers out there who wince when animals are treated horribly. Both Michelle and I are big wimps when it comes to animal abuse/death/etc. in fiction. Yes, even though I try to tell myself, “Fictional cat! Fictional cat!” it seldom helps. Well I agree with wimps over those who don’t bat an eyelid over animal abuse. Melinda, you had such a great couple of titles this week! I’m a huge Black Jack fan, and I agree that the more you read, the more interestinmg his character becomes. Volume 10, with the revelation of what his father did after he left BJ and his mother, is especially compelling. There was another aspect to BJ’s revenge that occured to me in those stories: they are extremely childish in nature. I wouldn’t expect Black Jack to forgive his father (I don’t think anyone short of a saint could do that; he’s not exactly a forgivable person), but BJ’s special blend of revenge had an infantile “I just want Mommy & Daddy to be together again!” aspect to it, which revealed another layer of BJ’s character to me: his growth and maturity were a bit stunted by his trauma, and inside he’s still an angry little kid inside. Also, never get on his bad side :) I’m upset that there are *only* about 17 volumes of this series! As for Ooku: squee! I loved Vol. 2 & 3 more than one. The relationship between Iemitsu and Arikoto, in all it’s horrible dysfunction and beauty, really cemented the story in my mind. I’m curious as to how the world develops politically and socially with a female-dominated society. But I don’t understand why elderly men, still potentially capable of conceiving, would be cast off. I also wish the volumes had historical endnotes so that I can better appreciate how Yoshinaga brilliantly meshes real historical events in her AU.